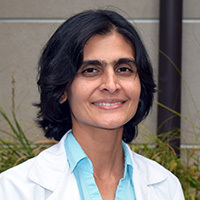 Sujata Kane, MS, RD, PA-C, works with the gastrointestinal medical oncology team at Winship Cancer Institute. Ms. Kane has a degree in nutrition and initially worked as a Registered Dietitian at a skilled nursing facility for 9 years. For the first 2 years after graduating, she worked in a primary care setting. Ms. Kane has a Master of Physician Assistant Studies.